First offered in 2016-17 (previously in pilot), the AP CS Principles assessment includes two open-ended through-course performance tasks and a timed paper exam containing multiple choice and multiple response questions. This question is about preparing students for the timed paper exam. What strategies are effective ways to prepare for this exam? What resources are available? How much if any class time should teachers plan on for going over practice questions along the way and in a spring review? Personal disclaimer: the best preparation for the exam is first to ensure that students master course content. If you have an AP CSP-aligned curriculum, then every day is a day of exam preparation. 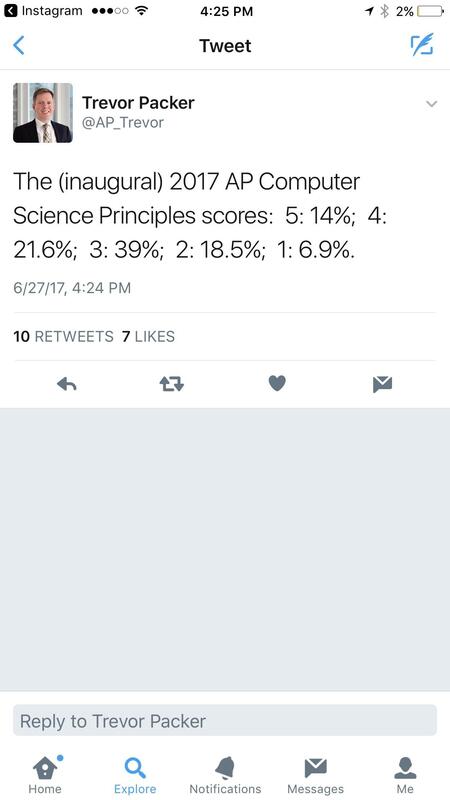 This touches on the biggest struggle I felt as a first-year AP teacher: am I teaching them computer science, or am I preparing them for a computer science exam? The ideal situation for me -- and the personal resolution I reached -- is that quality instruction, assessment and feedback, and student engagement with a rigorous curriculum (CS50 AP in my case) are the key elements to focus on for ensuring student success on the AP Exam. I'll enumerate how I used each of them and for simplicity refer to them by the number listed above. I pulled questions from #1 throughout the year. The first unit covered a basic intro to binary, so as a short formative assessment, I gave students the four sample questions they could answer having studied the basics of base systems. This was within the first two weeks, so right away we could talk about exam-style questions, specifically the ones that required selecting two right answers. I used sample questions a few more times during the first semester, but I didn't make it a priority (see disclaimer above). However, on the last day of class in the fall, I gave students a modified exam. We had studied three of the six Big Ideas tested on the multiple-choice exam in depth, so I selected questions equivalent to half the exam (enough for the allotted time and perfect for matching the pace of the real exam) and surprised them with this practice exam. There was no warning; students just had to trust what they had learned up to that point. We started the second semester going over this exam. I did an item analysis over break, so I could hone in on strengths and weaknesses and address them in the spring. In the second semester, I started to use #3 at certain sporadic moments. Since The Internet is arguably the most fact-driven of the Big Ideas, I used it as a resource for designing an exam on my Internet unit. Students were encouraged to buy it, but it was not a requirement. So much time in the second semester is taken up by Explore and Create that the multiple choice test is a lower priority until after spring break. Based on this year's Easter timing and AP schedule, I had two weeks of classes to devote strictly to exam preparation. This amount of time was more than adequate to build students' confidence and familiarity with the exam format. During these final two weeks of prep, I went through each question from #2, discussing how each Big Idea could be assessed. As a class we went through each Big Idea on the exam and connected the learning objectives to potential exam questions. The sample questions were great talking points for reviewing course content. I also gave an in-class exam using all the questions from #1 that didn't make it on the first practice exam. I paced it such that students had the same time/question that they would have on the exam. I wanted to make sure students had seen every official practice question and had the opportunity to ask about each one, especially the ones from the secure document that they couldn't take out of the classroom. The last big exam review I did was an optional exam review the Saturday before the exam. I had >50% attendance, and by the end the students felt more than prepared for the exam, and I felt confident I had done enough to get them ready for it. That day (and the following week) I made heavy use from #3 and #4. We basically went Big Idea by Big Idea, gaining more practice and focusing on particular tips and tricks for each. In particular, we went through a number of the robot questions and those questions that required analyzing segments of code. Bottom line: trust the quality of your instruction and your curriculum. Extra resources are nice, but the College Board's official practice is sufficient for getting students ready. A little exposure in the first semester and a week or two of focused multiple-choice review is plenty. Given that students will also prepare for the exam in the work they do for Explore and Create, they will be plenty prepared by course end. Also, the more students read, write, and understand code on whatever language you use, the stronger they will be come exam time; there is no substitute for this. Timed and multiple choice means that the students have to work quickly. This means that there is a simple (easier said then done) solution: improving their quick thinking skills. There are many different ways to improve quick thinking but i think that a very nice way to practice this is to give your students code with no comments and ask them to debug it, as fast as they can. This would be a class period and you wont take points if they miss bugs or take too long. For each code you give them let them ten minutes to debug it and then give them the next code. This will get them in the mood of working quickly, and thinking fast. This exercise is designed to teach students how to think fast and how to solve problem in a small number of minutes. We made a free review course on CodeHS that you can try out. It has hundreds of practice multiple choice problems broken down by topic as well as a complete practice exam. In particular, it's helpful to practice answering questions that use the pseudocode language because it has some quirks and may be new to students. You wouldn't want to first encounter it on the exam. Not the answer you're looking for? Browse other questions tagged high-school ap-cs-principles or ask your own question.